This month, Gary Tumolo is our featured neighbor. I sat down with Gary a few weeks ago to learn more about him and all that he has done for the neighborhood (We met at Stateside, and had some excellent small plates of gnocchi and cauliflower…kudos to the friendly staff!). 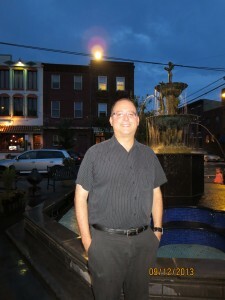 Gary volunteers for the Zoning Committee for Passyunk Square, which meets monthly. All neighbors are welcome to attend the monthly meetings (see the PSCA website for information), during which they review zoning applications in the neighborhood. They then send letters to the zoning commission of Philadelphia, which makes the final decisions. In this way, Gary and other zoning board volunteers make sure we have a say in what happens in our neighborhood. Gary’s day job, for which he actually gets paid, is for The Office of Housing and Development in Philadelphia. Gary manages the Redevelopment Authority of Philadelphia’s contracts as well as Housing Opportunities for Persons with AIDS (HOPWA) contracts. The HOPWA program is a Federal program dedicated to address the housing needs of persons living with HIV/AIDS and their families. Gary was awarded a certificate of appreciation in August from the City of Philadelphia Operation Town Watch Integrated Services in recognition for all the volunteer work he has done for the neighborhood. It is neighbors like Gary who make Passyunk Square such a wonderful place to live and work.